When you’re wheelchair bound, getting a ride to medical appointments or for other reasons can often be difficult. Though friends and family try their best, they aren’t always available when you need them. That’s why it’s good to have a professional provider of non-emergency medical transportation in Sacramento and San Jose CA that you can call and depend on. At America West Medical Transportation, Inc., your safe and reliable transportation is our job, and we take it seriously! Our vans are fully equipped to accommodate you and your wheelchair, and our friendly and professional staff are ready to help in any way. 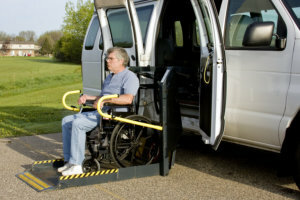 When you want wheelchair transport, America West Medical Transportation, Inc. is the smart choice for top-notch service. Be sure that you’ll get where you need to go, when you need to get there. Contact us to make a reservation.